Aaron Ramsey has already signed a pre-contract with Juventus so Arsenal’s boss Unai Emery has already told the club to look for a replacement. Arsenal midfielder Aaron Ramsey leave the Emirates Stadium at the end of this season after failing to agree on a new deal with the North Londoners. Juventus took advantage of Arsenal’s failure to renew Aaron Ramsey’s deal and will now join them for free in the upcoming summer transfer window. 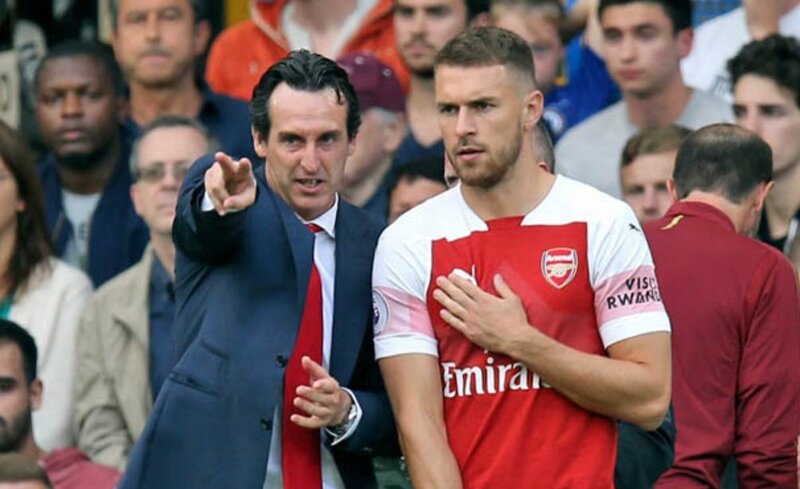 Arsenal head coach Unai Emery said that he was going to build his squad around Aaron Ramsey when he got appointed as the boss of the gunners but the Welshman will now leave because the club wasn’t ready to offer him his preferred deal. So Unai Emery has now requested for a replacement ahead of the new season which will begin in August. Many Arsenal fans believe that Denis Suarez is Aaron Ramsey’s replacement but they are wrong because he will be used as a winger as Unai Emery has been saying. Football Italia has reported that the gunners sent scouts to watch AC Milan’s Suso as his side beat Chievo 2-0 on Saturday. Suso is an attacking midfielder and can also play as a right-winger but Unai Emery will be hoping to bring him to the Emirates Stadium so that he can be rotating him in the CAM position with Mesut Ozil ( as he has done with Ozil-Ramsey this season ) next season since the German international will probably not leave in the Summer transfer window. Suso is a highly talented footballer who could suit Unai Emery’s philosophy because he’s strong and he does try getting past players through dribbling, and that’s something that the current Arsenal players lack because they rely on passing so that it opens up the defence. Aaron Ramsey is currently 28 years old and Suso is just 25, so the gunners would use him for a longer period than they would have used the Welshman since he’s three years younger than Ramsey. Suso has scored five goals and made eight assists in the Serie A this season. The Italian Serie A a very tough league that requires players to be physically strong so it won’t be hard for Suso to adapt to the demands of the Premier League. Aaron Ramsey will probably play as a central midfielder for Juventus but he has played as a central attacking midfielder this season under Unai Emery so Suso will technically be his replacement if he does join Arsenal.